The American Heart & Stroke Association has a great way to learn and recognize the signs of a stroke. If you suspect someone is having a stroke, it is important to act F.A.S.T. F Face Drooping – Does one side of the face droop or is it numb? Ask the person to smile. Is the person’s smile uneven? S Speech Difficulty – Is speech slurred? Is the person unable to speak or hard to understand? Ask the person to repeat a simple sentence, like “The sky is blue.” Is the sentence repeated correctly? T Time to call 9-1-1 – If someone shows any of these symptoms, even if the symptoms go away, call 9-1-1 and get the person to the hospital immediately. Check the time so you’ll know when the first symptoms appeared. Thank you to http://www.lighthouse.org/ for granting my use of your picture. This illustration, provided by lighthouse.org, is an example of what someone sees when they have right homonymous hemianopia. I have left homonymous hemianopia. This picture is very close to the view from my world as I look out onto a busy street. As a result of my stroke, the left half of my sight is always completely black. I have no ability to see the left half of the visual fields from either my right or left eye. I am lucky the remaining eyesight, straight forward and to the right, have remained normal. Another way to explain homonymous hemianopia is by using the example of an analog clock. When I look straight at its center, I will see the 2 from the twelve on top. The 1 from that twelve is completely black as are 7, 8, 9, 10 and 11. I am able to clearly see the other 1, the 2, 3, 4, 5 and part of the 6. If I look directly at someone’s nose, I can see their nose and the left half of their face. If I look at their left ear, the face will disappear into darkness. Please understand my missing eyesight is not what causes prosopagnosia. Rather, that stems from a different area in the brain. Even if I regained my ability to have a complete, unhampered view of the world, I would not be able to remember a face again. 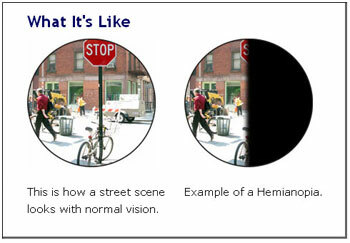 Having complete or homonymous hemianopia is different from losing sight from one eye in that the sight remaining from the good eye still allows for some peripheral capability. The unaffected eye will normally have the complete ability to see side views to assist with deficits created by the affected eye. Lacking peripheral sight on one side from both eyes can be extremely challenging. So how does this lack of sight alter my daily living? I walk into walls now I do not notice. I have found it more difficult to determine if someone is talking to me because it is more challenging to see where their eyes are directed. Shaving my legs becomes more difficult when half of the leg disappears. Vacuuming is an unending chore: I think I have cleaned the entire room only to turn my head and realize there was a large section I did not see therefore clean. Cooking is also negatively affected. This is most noticed when I am using a knife. When my left hand holds a vegetable, my right hand will cut. While looking at my right hand and where the knife is coming down, I will not be able to see my left fingers. It becomes dangerously easy to cut myself. Also, there is a major decrease in depth perception especially as night falls. Reading has also taken on unexpected challenges. When reading articles in magazines, I often am confused following the story. I easily miss the columns on the left. Yes, when missing eyesight, a whole new array of challenges present themselves. Learning to compensate was one of the great gifts created when the majority of my eyesight was missing when I awoke after experiencing my stroke. At first, most of my world was black. It was a very gradual process to regain the sight which I now have. When possibilities of what I could regain was first discussed with my physicians, we did not know what would be recovered. I had doubts I would ever see better. Essentially I could have been blind for the rest of my life and never have seen my daughters’ faces again. By the time I could see fifty percent from each eye, I was extremely relieved. I went from waking up to a dark room to being able to notice small details in faces and photos. I had the ability to get around without any added assistance. With the sight I now have, I was able to reclaim an independent life. I hope you have noticed nowhere in this post is the word vision used when explaining what I have lost. There is a definite difference between how these two words can be defined. Initially, I lost a lot of my eyesight. Currently, I still have a substantial portion of my eyesight missing. I would love to no longer walk into walls or hit my head on open cabinet doors. A large amount of my sight is gone and will probably, realistically, never return. Yet, I have not lost my vision. If anything, at the time my sight disappeared, my vision for life became even clearer. I carry hope and happiness daily in every aspect of my life. I have a vision to share this hope with everyone I can get my message to as I speak of being a young stroke patient, living with epilepsy and prosopagnosia. I no longer have sight, but I am filled with a tremendously powerful vision! It is now a submission in the 2011 Neuro Film Festival from the American Academy of Neurology Foundation. This film festival is designed to raise awareness of the many neurological conditions that effect men and women of all races and all ages.